The first states to officially begin regulating blockchain technology and business did so in 2014, when a guidance document from the Texas Department of Banking excluding blockchain activity from the state’s money transmitter laws kicked off a chain of similar opinions in other jurisdictions. Since then, at least 26 states—ranging from Alaska to West Virginia—have either introduced or enacted legislation regulating blockchain in some manner. The past seven months have seen the marked growth of legislative activity in the blockchain space, and at least sixteen bills have been enacted or proposed so far this year. Though the states are slowly coming to agree that the blockchain industry should be addressed by their legislative efforts, lawmakers are diverging wildly in their attitude towards blockchain businesses. On the one hand, states like Arizona, Nevada and Delaware are actively enticing blockchain entrepreneurs to their jurisdictions. Arizona’s HB 2417 officially modified the state’s Electronic Transactions Act to protect the legality of digital signatures. Further, the bill legalized the use of smart contracts by providing that “a contract relating to a transaction may not be denied legal effect, validity, or enforceability solely because that contract contains a ‘smart term.’” Not to be outdone, Nevada enacted SB 398, which not only recognized the legality of smart contracts but also prohibited local governments from taxing or regulating the blockchain industry. Delaware, hoping to remain the incorporation venue of choice, enacted SB 96 in June. That bill, which some view as a precursor to legislation that would permit a fully digitized securities exchange, legalized the use of blockchain technology to record stock purchases and trades. On the other hand, some states—following the lead of jurisdictions like New York—are applying stringent regulations to blockchain businesses that operate within their borders. Through the use of money transmitter laws, jurisdictions including California (AB 1123, proposed), Connecticut (HB 07141, enacted in June), and Alaska (HB 180, proposed) have enacted or proposed legislation that restricts the flexibility of small blockchain businesses. Generally, these states are focusing on regulating the industry by requiring digital currency business to comply with licensing and regulatory standards, up to and including a requirement that digital currency businesses hold currency equal to the amount they trade. Similarly, Florida enacted HB 1379 in April as part of a bid to close the loophole in the state’s anti—money laundering statutes which permitted the sale of digital currencies to individuals in connection with illegal activity. Fighting the tide of states that are placing digital currency exchanges under the umbrella of their money transmitter laws, New Hampshire recently enacted HB 436. That bill exempted persons using digital currency from money transmitter registration requirements and reversed an earlier law that had required such registration. 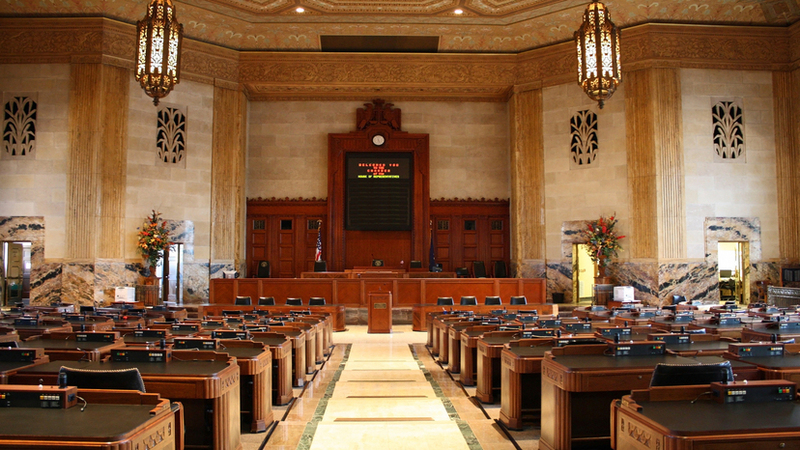 And Arkansas, attempting to address the confusion surrounding the money transmitter law controversy without modifying its own system, has proposed HB 1799, which would use the doctrine of “passporting” to recognize the licenses issued by other states. Not all recent blockchain legislation has such heady implications for the technology and the enterprises it has created. Like the entrepreneurs behind new blockchain businesses, lawmakers are finding creative ways to interact with distributed ledger technology. In Arizona, HB 2216 makes it illegal to track the use of a firearm with a blockchain. In June, the Montana invested in a local data mining center to the tune of $416,000. Texas lawmakers, honoring their reputation for independence, have proposed Joint House Resolution 89, which would amend the state’s constitution to protect the right of its citizens to use digital currency when procuring goods and services. Utah, eyeing the significant funds sitting in untouched in forgotten digital wallets, specifically subjected digital currencies to the state’s Unclaimed Property Act by enacting SB 175. Lastly, and perhaps most peculiarly, California’s SB 751 would make it illegal to buy raffle tickets with digital currency. Overall, legislators who had never heard of blockchain technology just a year ago are becoming aware that the distributed ledger industry is ripe for regulation. Intelligent investors, recognizing the inevitability of state-level blockchain regulation, will need to keep an eye on the progress of the bills discussed in this article, as well as future legislative efforts, throughout the rest of 2017. Texas Department of Banking, Supervisory Memorandum 1037, Regulatory Treatment of Virtual Currencies Under the Texas Money Services Act (April 3, 2014), available at http://www.dob.texas.gov/public/uploads/files/consumer-information/sm1037.pdf. As of July 27, 2017. See generally: Stan Higgins, Coindesk.com, Montana Boosts Local Bitcoin Miner with $416k Grant (June 7, 2017), available at https://www.coindesk.com/montana-local-bitcoin-miner-grant/. View the original article on Frost Brown Todd’s Financial Services Blog, 2017 Shaping up to by a Busy Year for State-Level Blockchain Legislation.